Boston barely, just barely, made the list of the Seven Wonders of the World, I mean, next to the Great Pyramid, it's right up there, but as Bostonians, we are truly in awe of our one-of-a-kind author-extroardinares, Ben Mezrich. He can do it all... a true departure from his previous book, this story, Seven Wonders, takes us along on an adventure of a lifetime with hero Jack Grady. When Jack's estranged brother, mathematician Jeremy Grady is murdered, it’s up to him to find out why. Jack's search leads him on a far-flung journey—from Brazil, India, Peru, and beyond—as he unravels the mystery that links the Seven Wonders of the World, and discovers that Jeremy may have hit upon something that’s been concealed for centuries. With the help of scientist Sloane Costa, they discover a conspiracy to hide a roadmap to the Garden of Eden—and the truth behind a mythological ancient culture. Its fast paced, heart-pounding story line will have you at the edge of your seat and wanting more... lucky for you, this is the first of three installments, with the movie rights already sold to 20th Century Fox with Brett Ratner and James Packer producing this epic thriller. 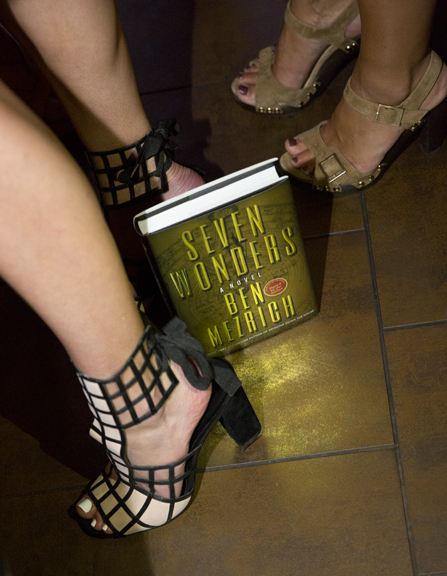 Last week, we joined Ben and his beautiful wife Tonya at the book signing event at the W in Boston. Ben looked dapper in a suit from The Tannery and shoes from Concepts, and Tonya in my favorite ensemble of the night, a skirt and top by Black Halo, necklace by Melissa Haus and YSL heels which could not out shine the glow of pride and happiness for the success of Ben's book and the event. Now that the kids are in school, it's time to go on a little adventure and experience the Seven Wonders. Ben's book is available now on Amazon.